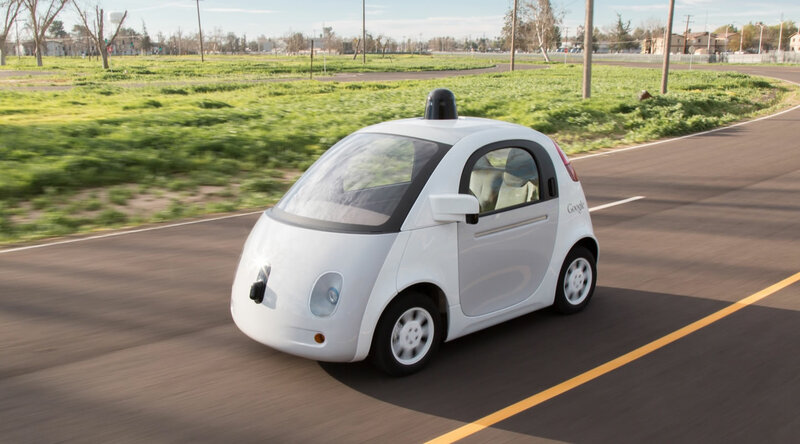 All of the major automakers are developing self-driving cars. In addition, rides-sharing companies like Lyft and Uber are spending massive capital to be a part of this revolution. And why not? When the self-driving car comes, it will be as big a game changer as the printing press and the internet. 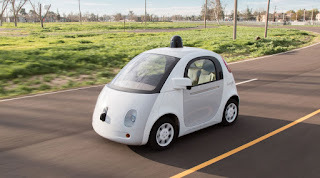 First - self-driving cars will be expensive and so few will own them. That is why Uber and Lyft are so interested in them. In order for the economics to work out, these cars will need to be almost continually driven. Most people only drive their cars a few hours a day at most. That simply won't be cost effective. Automation has the ability to keep the vehicle driving for 24/7 and so all the rides-sharing companies will keep their utilization up. Second - other cars will become cheaper. This seems counter to the first point, but as the cost of batteries continues to decline and as the world moves towards electric motors, the cost will continue to decline. Safety features and innovation might drive the price up a little, but I believe cars will become smaller and less expensive. Families will likely continue to desire cars to keep everyone together and safe, but single-occupants will likely choose other transportation. Third - Millennials will stop driving. Unless they have a fetish to be a Lyft or Uber driver, most Millennials will simply hail a Uber when they want to go somewhere. Millennials love the technology and they love the environment. Why burden themselves with a car? It's simply too much hassle. Fourth - Fixed rail will increase. Because Uber can get you to the fixed-rail station, the demand for high quality transit will increase. Fixed rail transit will likely increase considerably. People will demand a 3-5 minute headway between rail cars. And because fixed rail transit will become automated, this will allow for higher frequency of cars holding fewer people in each car. The major reason I believe transit will increase is because it can move people much cheaper than ride-sharing. People will use the moderately-more expensive Uber trip to get to and from light rail - and then take the much-cheaper light rail for the longer distances. This will minimize overall cost. But light rail will need to be clean, safe, and inexpensive. There will be a high demand for this to happen. Fifth - Buses will go away. There won't really be a reason for a bus anymore. With ride-sharing, buses will not be able to compete. 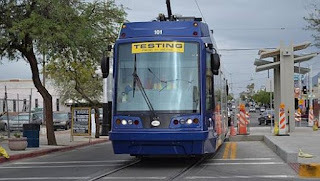 One potential use of a bus is as a test-system for light rail. A transit agency could add a bus line to see the demand and then use the bus line while the light rail is being constructed. Sixth - Parking lots will go away. This will he a hallelujah moment. Today's codes require parking lots that are way oversized. In fact, Strong Towns holds a Black Friday parking event across the nation. The idea is that Black Friday is supposed to be the busiest shopping day of the year. But even on this day, most parking lots are half full. This creates all kinds of problems including increasing walk distances and eliminating perfectly good land from productive uses. When you can drive right up to the store, you will not have a need for a parking lot. However, there will be parking lots strategically placed around towns to park unused vehicles overnight. But automation will allow them to be parked closer together. Seventh - Older people will not longer be dependent upon others. This will be the greatest joy of all. When I lived in Phoenix during the 1980s, I was a civil engineer fresh out of college. I had been hired by a company that was performing the route location study of the 303 freeway. We knew it wouldn't be built for years, but ADOT knew that reserving the right-of-way was paramount. During this time, discussions were underway to construct light rail in Phoenix. Many people were against this initiative and sad to say, I was one of them. I had been well-schooled in transportation theory. I knew that light rail was a very expensive technology and only worked in some cities because of their high development density. But Phoenix didn't have high density. Phoenix was created with urban sprawl. Light rail would be expensive and become a drain on the economy. Then I moved to Denver. Right before I moved, Denver had passed an initiative to construct light rail. Being similar to Phoenix, I didn't think the light rail was a good idea. But since I did not have a chance to vote on this, there was nothing I could do except perhaps righteously tell people that light rail was a folly. There was something that I had not considered. And that something was the genius of fixed rail. You see light rail is expensive. Unlike a bus, a light rail line doesn't shift around. This might seem trivial, but it actually isn't. When light rail is placed, developers have a certainty that light rail stations won't move and so they are willing to take the chance to build high-density developments near them. And if a person is walking distance to a light rail station, she could potentially eliminate a car, a car payment, insurance, and the hassle of driving to work. That is what Millennials are looking for. And that makes property values around the light rail station very valuable. In fact, the only downside is that some people may not want to give up on their cars. These people can't make all of their trips by light rail and so they are hesitant to relinquish their car. But Uber and Lyft and other ride-sharing technologies have changed all that. Millennials can live without a car. Even those who don't live near a light rail station are giving up their cars and going full-Uber. For communities, this will be a game changer. Fixed rail will not only be a tool to move people around, but it will also become a major part of the toolbox to direct growth and density. In my opinion, high quality, high density, urban Millennial habitats will be built around light rail stations. And any community that wants to attract young, intelligent, highly-educated people need to start planning their light rail stations NOW! Automobiles account for approximately one fifth of all greenhouse gas emissions in the US. While there are other sources of greenhouse gas emissions, the automobile is the most challenging. People want mobility with quick refueling times. At this point, the gasoline-powered engine still seems to be the popular choice. In Vail we have an even greater challenge in that all jobs, and retail is miles and miles away. It's pretty horrible when the closest bank is a fourteen mile round trip or more. What is needed in Vail is local commerce and local jobs. It would be even better if those jobs were within walking distance. One might argue that a short vehicle trip doesn't really use that much fuel, but cold start extra emissions on a percentage basis are incredible high for short trips. Overall, wouldn't it be great if the closest store was within walking distance? Of course, for the last 50 to 70 years we have built our communities in exactly the wrong way to encourage walking for short trips. Many years ago there was a small grocery store within walking distance of every community. But now, we build huge grocery stores and place them in such a way that one must drive a car to reach them. Take a look at the new retail at the intersection of Houghton and Old Vail. How would a person in Rita Ranch even walk to this location? There is no pedestrian route anywhere. What a mess. When the Safeway is built, most people will drive to it. But what if there was a pedestrian path from Rancho del Lago through Pantano Wash such that people could walk if they chose? There are many homes in Rancho del Lago that are less than a half mile, or a 10 minute walk, to Safeway as the crow flies. The problem is we don't have any pedestrian paths. Additionally, Pima County has zoned almost everything in Vail as residential. This means that when businesses want to relocate, they can't. So they'll locate somewhere else, and we'll drive a long distance to reach them. But what if businesses and industries were created right here in our community? What impact would that have? The real way to combat climate change is to make our communities more walkable and to locate some highly-frequented businesses right in our own neighborhood. 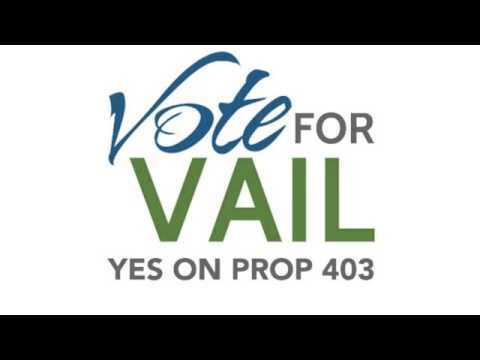 On November 5, 2013, Vail residents voted on Proposition 403 to create the Town of Vail. The measure was soundly defeated. In another post, I explain why I believe voters didn't support the town. But in that post, I didn't explain how I believed that Incorporate Vail didn't articulate all of the good reasons why The Town of Vail is needed. A minimal government is possible with the state-share revenue. Incorporate Vail calculated that the state-share of revenue would be approximately $3.5 million. The basic functions of government are: Police protection, Road Maintenance, and Administration. They were confident that a minimum government would be fiscally sustainable. With a new Town of Vail, more of the state-share of roadway improvements would be at the town's disposal. Vail could chart its own course. But Incorporate Vail left out quite a few other advantages. This article will try to articulate them. Vail would have a seat at the table for all regional decision-making. Without a town, all of Vail's decisions are made by the Pima County Board of Supervisors, and more specifically the Supervisor of Region 4. Region 4 includes Rita Ranch, Coronado National Forest, Saguaro National Park, Colossal Cave Park, Vail, Corona de Tucson, Pima County Fairgrounds, and Green Valley. All of these areas want Pima County services. And all of Region 4 competes with the remainder of Pima County. 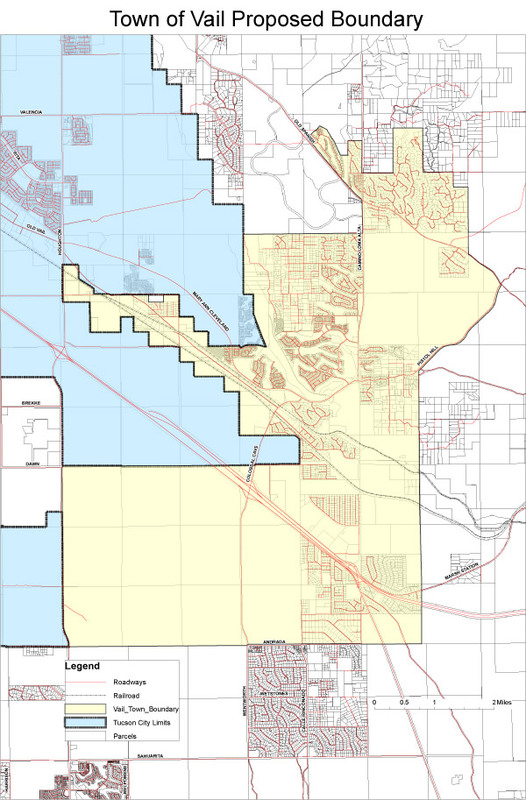 And Pima County competes with the City of Tucson, Sahuarita, Oro Valley, Marana, Why, Ajo, Lukeville and Tohono O'Odom. It's easy to see how Vail might get lost in the crowd. That is why it was so very difficult to fight for the Colossal Cave Road improvements. Vail residents saw this road as a huge safety issue, but our voice was being drowned out by all of the other voices. Under a Town of Vail, our voice would not be so diluted. We would have the same regional clout as Tucson or Pima County. We would be able to place Vail advocates on all boards and commissions to compete for funds in our town and support projects that directly benefit our residents. One might assume that the Region 4 Supervisor would be our advocate, but by definition, even his voice is greatly diluted. The only services that Pima County is required to provide are police protection, courts, administration, and streets and roads. Now Pima County does more than these basic services, but this is because County residents demand more. So the county undertakes bond elections to receive the funding to create these projects. And because they do, residents don't necessarily see the need to form a town to get basic town-like services. Bonding is very difficult. The last two bond attempts have failed. The simple fact is that Pima County has more projects than funding. The bond doesn't go just to the future projects, but provides an income stream so that the County can continue with basic services. This is unsustainable. And at some point, the County will leave some areas completely unserviced - even when these areas have large populations. Vail fits this category. One great need in the Vail area is adequate parks and recreation. Other than Colossal Cave Park and Cienega Creek Preserve (which requires a permit), there are no places for Vail residents to play. Vail has no football fields, soccer fields or even hiking trails. In fact, there are no plans in place to provide them in the future. Without a simple plan, they can't even get considered for funding. Incidentally, there might be one way to solve this issue without creating a town. Vail could create a Parks and Recreation Overlay District to Vail residents and collect a property tax. This tax would then provide for construction and maintenance of parks in our area. But I digress. This shows how strong a pull the Vail School District really is. People move to Vail for the schools even though there are no parks. But if the Vail School District ever stopped being a strong performer, then it would be Game Over for Vail. 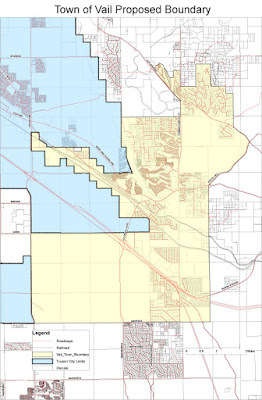 All planning and zoning in Vail has been performed by Pima County planning staff. It is amazing to me the lack of motivation that county staff has in planning Vail. They correctly assume that most of the state lands will remain vacant for the foreseeable future. Why bother with Vail? But Vail is seriously flawed. There are very few acres set aside for commercial property. This make existing commercial property so valuable that it is priced out of the market. 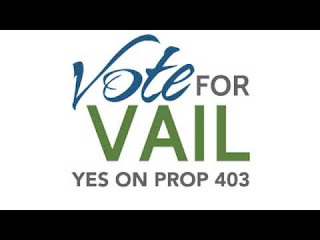 There is no comprehensive plan to bring any employment to Vail. (And why would Pima County or Tucson even care about employment in Vail? That's not their job.) 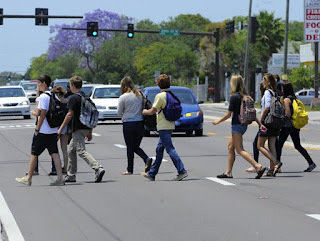 There is no comprehensive plan for bikes, pedestrians, commercial, employment, or anything. But at some point the vacant land of Vail will be developed. And without a Master Plan, all of this land will become housing. There will be no land reserved for open space, no land reserved for parks, no land for commercial. Just housing. This is because Vail residents will have no input into the future development of the vacant land. Vail will become what most people believe it to already be, a bedroom community of Tucson. There is another path. A Town of Vail could create a comprehensive plan that shows what types of developments it desires. 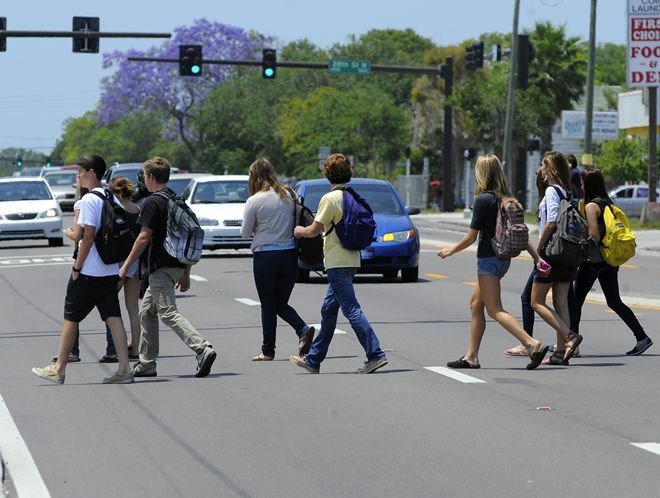 It could plan for areas of commercial, employment, recreation, open space and residential. And the great thing is that once Vail become a Town, there are state funds and consultants ready and waiting to make this plan happen. People look at other towns and notice that their annual budgets are in the tens of millions of dollars. How do they do that? How does a Town like Benson have a 20 million dollar budget with fewer people than Vail? The answer is that there are additional funding sources. Once Vail becomes a town, it becomes eligible to tap into them. For example, the Federal Government has a program to provide funding for bridges. If there is a need, say to get pedestrians from Wingview to Cienega by walking (it is less than a mile) and a bridge is needed to make that happen, they have money for it. Wouldn't it be great if Vail could start tapping into these funding sources and start using those funds for construction projects in Vail? And there are hundreds of them. Maybe even thousands. 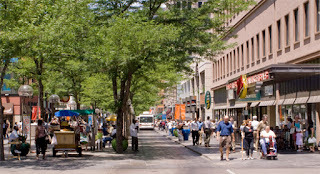 If the Town of Vail included the I-10 corridor, this could create an income stream for Vail that would be unsurpassed. If Vail created hotels, restaurants and gas stations along I-10, and had a reasonable tax rate, then it could probably fund the entire town on the I-10 tax alone. For me, this is the greatest reason to incorporate. Vail isn't just some town that just came together recently. Vail has been around since before the railroad. And most importantly of all, the nights in Vail are spectacular. And let's also agree that part of the allure of Vail is the open feel. So the Town of Vail made a commitment to leave vast swaths of the vacant land as open space. Is that a future worth dreaming about? All of these are some of the reasons that were not shared with the voters. But I talked to one person who was against the town and they said that Vail wasn't ready yet. Perhaps one day we will be. 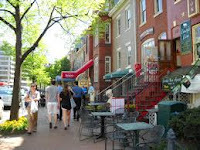 Streets were originally made for pedestrians before cars. If you lived in the downtown of a city, would you need a car? It depends upon the downtown, really, and whether you could perform the vast majority of your daily routine by walking, biking, or transit. If you lived in a flat in downtown London, you would be crazy to own a car. But in Vail, you simply cannot survive without a car, unless you have extremely unusual circumstances. How would you shop and work? Actually, there is a way to calculate whether surviving without a car is possible. It is called a "Walk Score". A walk score is a number between 0 and 100 which describes the walkability of a location. If your walk score is 0, then everything you do in a daily routine requires a car. If your walk score is 100, then everything you do can be done without a car. There are people, and increasingly - younger ones, who are actually choosing the community in which they want to live based upon a high walk score. Why is a high walk score good?